UZ-10 is improved model of UZ-100M. Newly designed body has DC9V input and Ø3.5mm earphone jack that matches to Sony earphone. 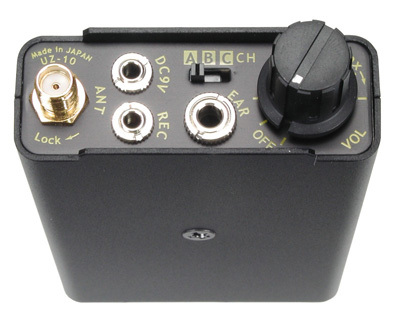 On board DC9V input is very useful for a long hour receiving. Regular type is supplied with UHF-A, B and C channels. We prepare the type preset with UHF-D, E and F channels too. Please contact us for availability. Toughness, usability and high sound quality.